In June 1990, Im Kwon-taek released the first film of what would become The General’s Son series (1990-1992). The General’s Son singlehandedly revived the jopok, or organised crime, film in South Korean cinema, following a drought that stretched back to the 1970s and early 1980s. Significantly, in October 1990 the South Korean government declared war on organised crime and proceeded to conduct raids on various criminal organisations and arrest leaders of the principally family-led businesses throughout the country. Though government raids and arrests occurred following the release of The General’s Son, it is interesting to imagine that headlines about real-life jopok members fed into the ongoing interest in the film and the rest of the series, and contributed to making it a box-office hit. One need only recall the classic Hollywood gangster triptych of Little Caesar (1930, Mervyn LeRoy), The Public Enemy (1931, William A. Wellman), and Scarface (1932, Howard Hawks) to think of a scenario of crime headlines, film production, and the box-office informing each other in such a way. According to Jinsoo An, more immediately in the mind of director Im Kwon-taek in making The General’s Son series was the idea of reviving the screen image of Korean masculinity. This idea was partly triggered by the highly popular and influential 1980s and 1990s Hong Kong action and Triad films – courtesy of filmmakers John Woo, Johnnie To, and Ringo Lam, among others – which began to be distributed in South Korea at the time. 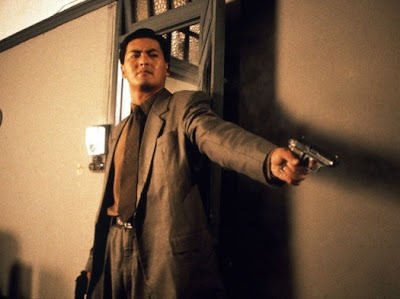 Looming large above all other idealised images of cool, handsome, and individualistic masculinity was Chow Yun-fat. With Chow’s height and tragic-manic persona in Woo’s films, he literally and metaphorically loomed over his male costars such as Leslie Cheung and Tony Leung. Of course, the interesting detail is that John Woo modeled Chow Yun-fat’s walk, dress, and overall performance after the French actor Alain Delon and the crime noir films he did with Jean-Pierre Melville, especially Le samouraï (1967). In turn, Melville was inspired by Alan Ladd’s portrayal of an assassin in the Hollywood film This Gun For Hire (1942, Frank Tuttle) for Le samouraï. 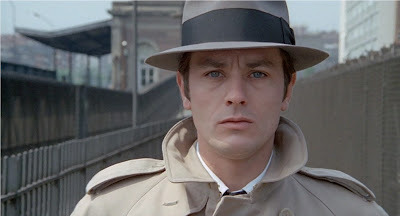 In these two films, Ladd and Delon personify assassins whose otherworldly physical beauty creates a compelling tension with their criminal profession and stoicism in the face of killing and death. But what began partly as a way to distinguish Korean crime action films and images of masculinity from those found in Hong Kong films (flavoured with Melville-Delon) has become a full-fledged successful, dynamic, and self-sustaining genre in its own right in contemporary South Korean cinema. Between 1990 and 2005, South Korean cinema saw a plethora of jopok films (e.g. Beat [1997, Kim Sung-su], Nowhere To Hide [1999, Lee Myung-se]), gangster comedies (e.g. No. 3 [1997, Song Neung-han], My Wife is a Gangster series [2001-06], Marrying the Mafia series [2002-06]), and other films that appropriated gangster tropes for their own purposes (e.g. Hoodlum Lessons [1996, Kim Sang-jin]). If by 2005 South Korean cinema had reached a jopok saturation point, it is also the point of departure for another phase in jopok evolution. Films such as A Dirty Carnival (2006, Yoo Ha), The Show Must Go On (2007, Han Jae-rim), Rough Cut (2008, Jang Hun), and Breathless (2009, Yang Ik-jun) run through the usual gamut of jopok themes of duty vs. personal desire and the endless cycle of violence, but they also toy with the jopok genre in a marvelous way and present a different level of grittiness, self-reflection, and auteur expression over and above commercial impulses. A Dirty Carnival and Rough Cut are particularly interesting for having the component of a film-within-the-film. Rough Cut is especially superb for its commentary on the desire for the realism of violence and the gangster as a film fetish to be admired and feared at the same time by having an actual gangster play opposite an actor in a gangster film. The very good looks of lead actors Jo In-seong and So Ji-seob in A Dirty Carnival and Rough Cut may not be absolutely crucial to the trope of admiration and fear of the gangster, but they certainly factor into it and reference that tension between beauty and violence with Ladd, Delon, and Chow. 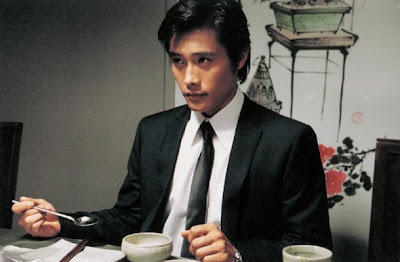 In the context of this Ladd-Delon-Chow loner lineage and idea of cool, handsome, and individualistic masculinity, arguably the most existential interpretation thus far is Kim Ji-woon’s 2005 film A Bittersweet Life, while the most literal interpretation has to be Lee Jeong-beom’s 2010 film The Man From Nowhere. A Bittersweet Life explicitly takes the jopok film to the level of noir, that is, a level of stylisation of lighting, place, film references, (masculine) interiority, and narrative trajectory. The distinction between the gangster film and noir comes from director Kim himself. Kim said in a master class on A Bittersweet Life back in 2009, “How I thought of noir was that it's a genre that expresses a gangster movie in a more aesthetic way. I think that gangster movies and film noir have to be distinguished [and] separate.” A Bittersweet Life is a stylistic exploration of one’s place in the world at a given time, one’s actions, one’s emotions that fuel or thwart such actions, and the consequences of in/action through the proverbial loner and revenge scheme within the criminal underworld. Such a description also applies, though to a lesser degree, to The Man From Nowhere (2010). It is stylistic in its own way and actually opens up the revenge scheme to reflect the globalised, diversified world in which criminals and their organisations must now work. The differences in the ways in which these two films stylistically explore one’s place in the jopok world are much more marked than the similarities. For one thing, the level of noir elements in A Bittersweet Life is much more pronounced than in The Man From Nowhere, which factor into the nature of each film’s narrative and conclusion. In A Bittersweet Life, the existential malaise of the lone anti-hero is explicit and falls outside of any moral context. Sun-woo (Lee Byung-hun) makes the conscious decision of not killing his boss’ girlfriend and clandestine boyfriend and pays for it. To a tee he follows the protocol of revenge to its inevitable end after his boss and cohorts beat him to a pulp. In The Man From Nowhere, the existential malaise is also palpable but fitted out more along moral/ethical lines as Tae-shik (Won Bin) is forced to come out of his shell and into contact with a crime organisation to find a kidnapped young girl. While A Bittersweet Life follows a man bent on revenge against his own boss and cohorts and carried away by internal (il)logic that he himself does not question, The Man From Nowhere is about a man who gets haphazardly involved in a rescue and must contend with a host of external malicious forces. While the narrative trigger for Sun-woo’s revenge in A Bittersweet Life is romantic, the impetus for Tae-shik in The Man From Nowhere is more familial through the young girl. Perhaps the most significant existentialist difference between these two films is the death and survival of the protagonist. Take a wild guess as to who dies or survives. Despite, or because of, these differences, these two films make for an interesting study of comparison, especially with regards to their respective lead actors and how the films narrativise and deconstruct their masculine beauty. Before focusing on Lee Byung-hun and Won Bin, some more general comments on the two films are in order.